254 km of slopes on one ski pass: Arriving in Sölden we received the Pow(d)er Card. A brand new offer for all guests in the Ötztal with a ski pass for three days or more. With this card you got the opportunity to ski or snowboard in both skiing areas of Sölden and Obergurgl-Hochgurgl. During the total season (16 November 2017 to 22 April 2018) skiers and snowboarders have the possibility to ride 254 km of slopes with 55 mountain lifts. A great offer we think! As we knew Sölden already for some winter sports holidays about ten years ago we were very curious about the resort of Obergurgl-Hochgurgl. In this short-ski trip of three days we decided to go to this resort on our last day, as the weather forecasts showed even some sun on that day. Waking up early and opening the curtains we saw the weatherman did not have made their best prediction of the season. Clouds covered the sky and we saw the first snow falling on the roofs of the houses close to our Hotel Tamara. After two days on the slopes of Sölden, where we found great snow, perfectly prepared slopes and good atmosphere in the mountain huts, we hoped for one day of clear skies. As we are journalists we wanted to make some good photos and videos of mountain tops covered in snow and set in the light of an early morning sun or just before sunset. 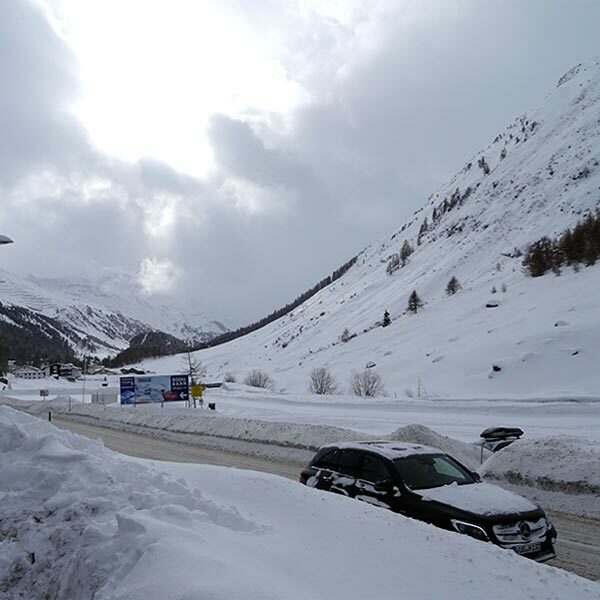 During breakfast in the hotel we heard that it was expected that there would be a lot of snow coming up and there was a risk of closing the road between Sölden and Obergurgl-Hochgurgl. We made it a very fast breakfast, got our skiing material and went to the bus station (at the Giggijoch station) as fast as possible. 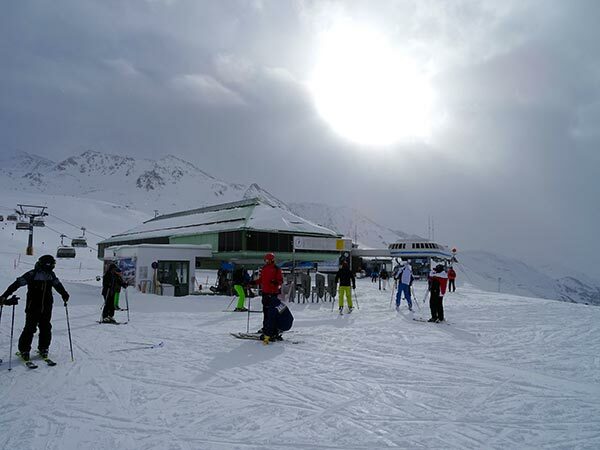 From this point it takes approximately 40 minutes by bus to get to the ski lifts of Obergurgl-Hochgurgl. By car (with winter tyres on and snow chains in the back) the ride will be 20 minutes from the center of Sölden village. The ride to the skiing resort is great, with beautiful views on your left and righthand side. Even when it is snowing (like on this day) time flies watching the mountains, chalets and roads covered with a thick layer of fresh snow. 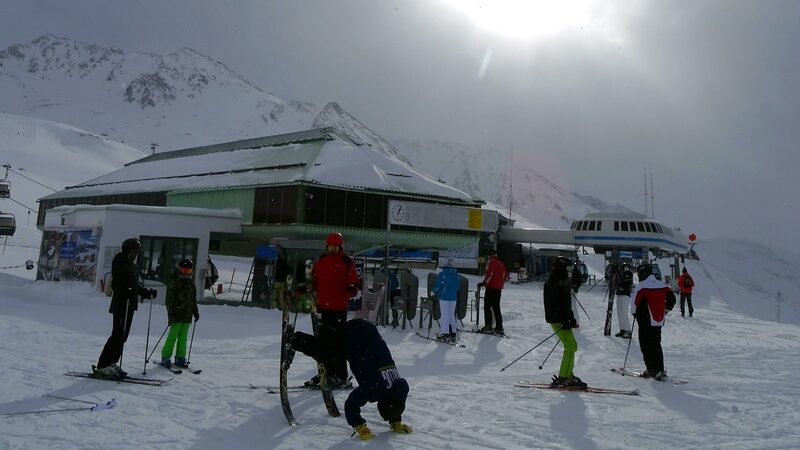 Arriving at the ski lift station in Hochgurgl you’ll find a warm welcome with a yellow umbrella bar just in front of you. A good place to start a skiing day with a strong coffee to warm you up before taking the cosy little ski lifts (Hochgurglbahn I & II ). These two lifts bring you fast to the heart of the skiing area. Obergurgl-Hochgurgl is the highest church village in Austria. 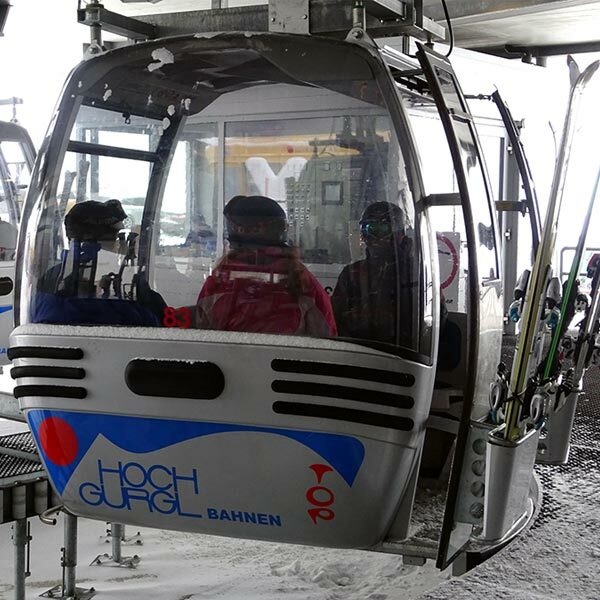 At a height where many lifts end, the ski area Obergurgl-Hochgurgl really starts. 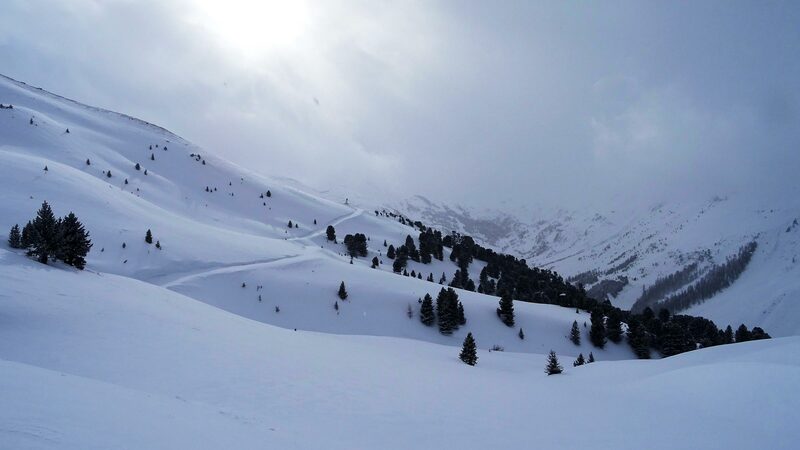 The perfect infrastructure and relaxing atmosphere contribute to a successful winter sports holiday with a choice of 110 km of slopes between 1,800 and 3,000 meter above sea level. This allows you to often ski from and to the front door. Due to the high location, snow security is guaranteed from mid-November to the beginning of May. For a spectacular view, visit the ‘Top Mountain Star’, located at the top of the 3.080 m high Wurmkogel. This panoramic dome made of metal, wood and glass offers views of the Ötztal Alps and the Dolomites. The Hohe Mut alpine restaurant is one of the most beautiful viewpoints in Tyrol and overlooks 21 imposing peaks above 3,000 m. See this panorama with a 360 degree view from the alpine restaurant at 2,670 m.
When we arrived at the top of the Hochgurglbahn the wind was blowing and the snow created a white curtain over the mountains. 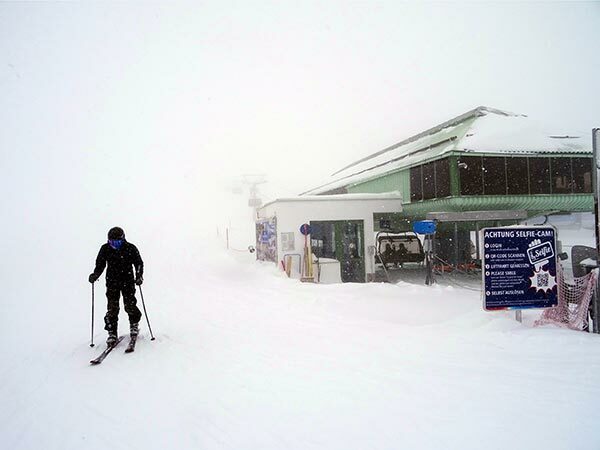 Tough weather to ski. And that’s what most people thought that morning. 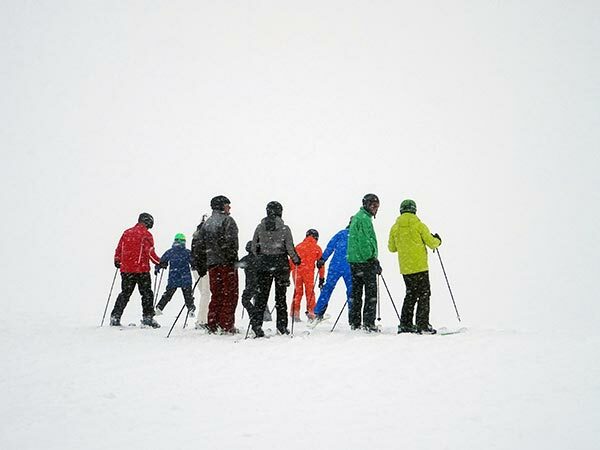 We had the whole mountain for ourselves and a handful of other real winter sports lovers. Wow, this will be a great day to hit the slopes. With no sight and the strong wind we only could feel the fresh snow under our skis. Finding our way following the signs on the side of the slopes. This is what we like, being in the mountains with only the elements. After some hours of skiing and warming up in the ski lifts the sun came through the clouds and we had our first views over the mountains of Obergurgl-Hochgurgl. This skiing area is so different form Sölden. 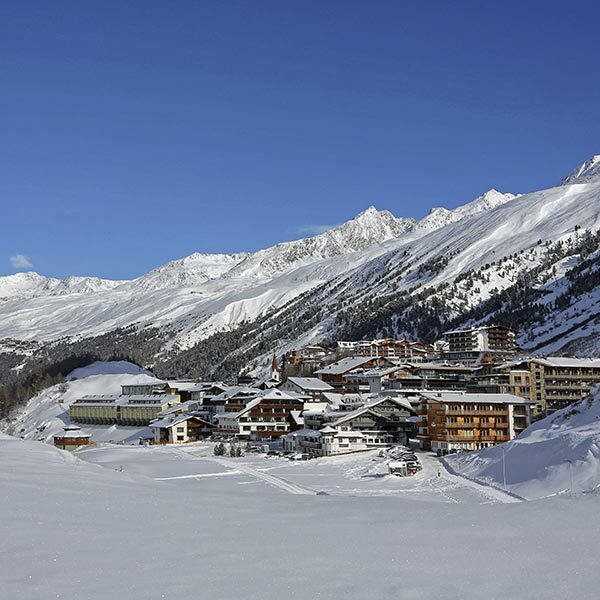 Where Sölden is a real paradise for people who love many slopes, many mountain huts and entertainment, Obergurgl-Hochgurgl feels – despite top-notch lift infrastructure and more than 100 kilometers of slopes – like winter sports as in “the good old days”. Beautiful mountains as far as you can see, being in the middle of nature and small cozy huts where you can relax and enjoy your drinks and a good meal in a quiet place. After some hours of skiing and having a fast lunch and again some nice long rides on the quiet and wonderful slopes it was time to go back to Sölden. Knowing that we would come back in the near future to see more of this extremely beautiful skiing resort with a real feelgood atmosphere. 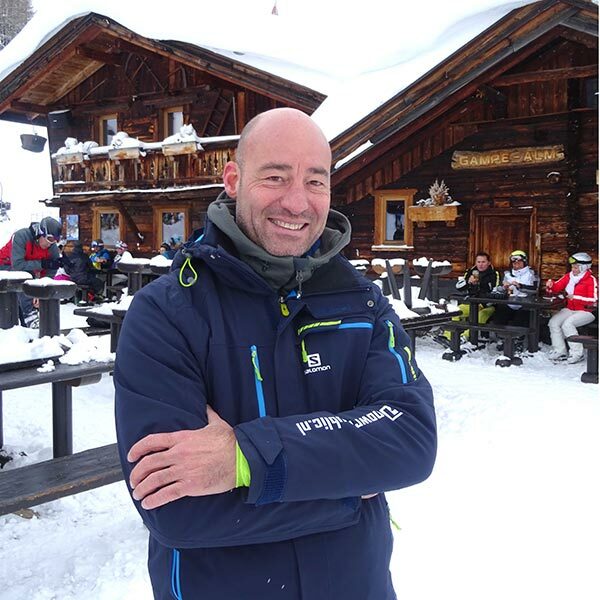 Edwin Hagenouw is owner and journalist of the online winter sports magazine Snowrepublic.nl and the outdoor website Mountainreporters.com. With a team of fourteen reporters we publish daily news and travel reports. Edwin is a big fan of skiing, sailing, mountainbiking and hiking. His favourite destinations are Scandinavia, Austria and South America.